Creating an image for a marketing piece, theater poster or otherwise, used to be relatively straight forward. Shoot the photograph for the use, usually a printed piece, and get on with it. Now, the printed theater poster maybe almost an after thought. The primary use of the image is used in a digital poster for online marketing like web sites and email blasts, social media marketing and the occasional banner ad. The traditional theater poster gets reduced to a run of postcards and a couple of marquis pieces to put in the lobby to boost “impulse buy” ticket sales. Not that I have a problem with that at all. It gives us more flexibility to craft a specific image for the target, the tools for more inventive ways of getting it in front of our fans and audience, and a little budget boost, since we are not paying for printing and distributing 500 theater posters and killing all those trees! 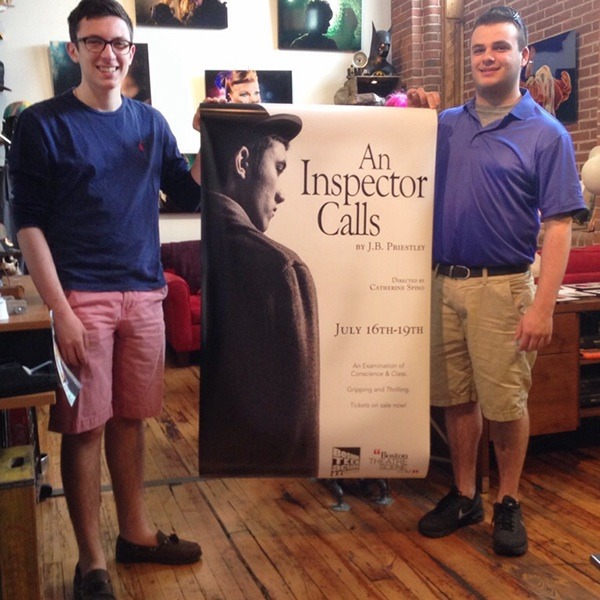 Jack Serio and Catherine Spino, the two leaders behind The Boston Teen Acting Troupe, came to me with their summer theater production: An Inspector Calls, by J.B. Priestly. Despite taking place around 1912, the piece is a particularly timely look at the differences between the classes. They distilled for me some of the major themes and we began to throw around some ideas for images. We knew right away that we wanted to update the feel of the marketing for modern audiences and stay away from the foggy English night posters that evoked mystery but were almost cliché in their themes. Our concept was to create drama by simplifying and distilling the visuals down to a high contrast black and white image of the Inspector, looking over his shoulder. The goal was to cut through all of the visual static and create an image that would stand out on the wall or on a web page because of its simplicity. The nice thing about concepting a very clean and simple theater poster is that the actual photoshoot production is also minimal. However, minimalism means that everything that does get included becomes that much more important. Neil, the costumer for the show, brought a choice of jackets and shirts, with six or seven different period hats. Brenden, the actor playing the Inspector, went through a number of changes before we decided that this combination had the right feel for the concept, the story of the play, and for the poster. Total prep time for concepting, collecting the costume, planning the shoot production was probably a couple of days. The photo session itself lasted less than 20 minutes. Post production was another day to finalize everything. The final image was used on a giant poster for the lobby of the Boston Center for the Arts Plaza Black Box Theater on Tremont in Boston’s South End and a printed postcard that the cast and crew would hand out around the city. It was also used for a wide variety of web sites, including Boston Teen Acting Troupe’s home site, and their email newsletters. 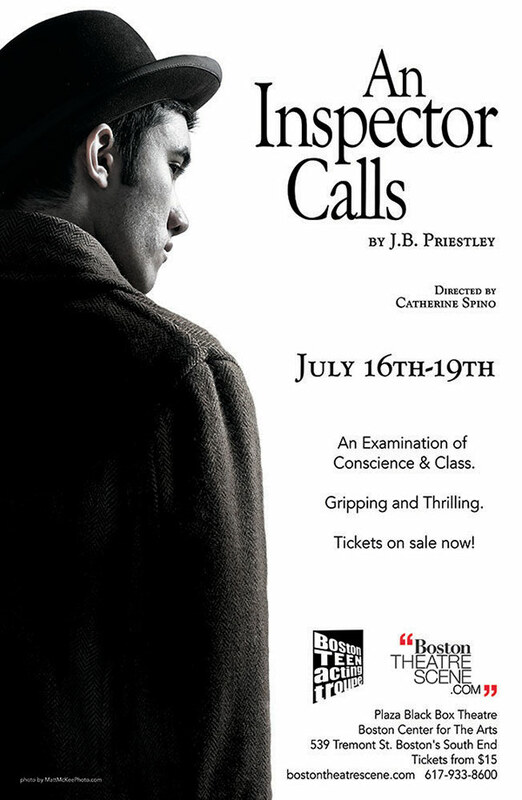 Creating an eye catching Theater Poster for Boston Teen Acting Troupe's production An Inspector Calls.